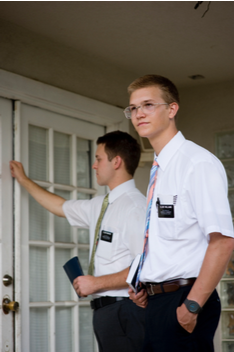 What’s the best response to Mormon missionaries when they come knocking at our door? People ask because they know that both Dennis and I have been on that side of the door – (i.e. as LDS missionaries approaching Christians with a plan to convert them to Mormonism).! Dennis was a lifetime LDS and I was a convert to Mormonism. Thus Dennis understands Mormonism from a “generational” viewpoint and I from a “converted Mormon” viewpoint. I was a biblical illiterate and fell for false claims of Joseph Smith and his church and joined the LDS Church. Less than a year after my conversion I was called to serve as a full-time LDS missionary in my own country, Finland, where Dennis was already serving his 2.5 year mission. The Mormon Church gains annually nearly 300 thousand converts from Christianity around the world by their about 85-thousand strong missionary-force. The LDS Church now enlists 18-year old young men as missionaries immediately after they finish High School, and young women after they turn 19. They are first sent to the Mormon Church’s training facility for about 3 months where they learn a script they must follow when they talk with potential converts. Most of them have no real knowledge of what their religion is all about. The Mormon Church does not send missionaries to countries where Christianity is not well known. They send them to countries where Christian missionaries have done the groundwork and introduced them to Christianity. Mormon missionaries say that they are Christians too and because Mormons use Christian terms and words, their missionaries are able convince many to leave the churches they now belong to and join Mormonism. Mormons are “sheep-stealers” – stealing from the flocks that are not yet prepared to discern what is biblically true and what is not. Christians who can challenge them with their biblical knowledge. Much later we came to understand that bearing our testimony was to assure ourselves that Mormonism is true just in case if we had heard something that could present doubts to our hearts of what Mormonism is and what we were involved in. Biblical warnings of another gospel and another Jesus is not obviously taken seriously, for every year about 300 thousand Christians convert to Mormonism. This is the very reason why Apostle John wrote that we are NOT to invite any representatives of a “false gospel”, as Mormonism is, to our homes to teach us. In Christian homes only the Truth of the Bible is to be taught! We may invite them in to our homes only if we know the Bible doctrine of God, Jesus and salvation well enough to teach them and correct their beliefs. Mormon missionaries begin their presentation of the Mormon Church with the “First Vision Story” of Joseph Smith, telling how God called Joseph to be the prophet of the Restoration. The Mormon Church has all along insisted that The VALIDITY OF THE MORMON CHURCH RESTS ON JOSEPH SMITH’S FIRST VISION STORY. They say that IF IT IS NOT TRUE, THEN THE MORMON CHURCH IS A FRAUD. This story is important for Christians to know so that they can refute Mormonism from the start, directly from the Bible. it is not true, then all the rest of Mormonism is not true either! That would not have been possible if God the Father also had a physical body! However, if you want to continue conversing with the LDS missionaries, the next issue they will present is the total apostasy from the truth. They say that after the death of original apostles the Church of Christ fell into apostasy and the Priesthood was lost, and from that time on there was no authority to perform baptisms or other necessary ordinances until God called Joseph Smith and restored the Church of Christ with the authority of the priesthood, i.e. both Aaronic and Melchizedek Priesthoods. Young Mormon boys, from age 12 through 18, are ordained into the Aaronic Priesthood – and from age 18 up, to the higher or the Melchizedek Priesthood. When they tell you this, you need to ask if they know what were the requirements in Israel to have the Aaronic Priesthood? They may not know, so you need to inform them that the office of a priest was a hereditary office with many strict requirements. To become a Priest, a man needed to be 30 years old and from the tribe of Levi, and in that tribe a descendant of Aaron and without any physical defects. priesthood holders, are from the tribe of Levi and in that tribe from the house of Aaron? Since the LDS Church claims to have also “restored” the Melchizedek Priesthood, you need to inform them that there never was a Melchizedek Priesthood in Israel – only a Person, Melchizedek, who was a type of Christ (Hebr. 7:1-3) for he was a Prophet, Priest and King, as is our soon coming King, Jesus. The Levitical Priesthood was abolished (Hebr. 7), and the Gospel of God (1 Cor. 15:1-4) was declared as the message of death, burial and resurrection of Jesus for our salvation. It was “once for all delivered” as Jude 3 says. No redelivery needed. As a “proof” of apostasy, requiring restitution, as they say, the missionaries will read 2 Thess. 2:3 that says that there will be a falling away. You need to open your Bible and read with them, beginning from verse 1 on, to see what Paul was actually saying. Paul warned them not to let any man deceive them with that saying, for “the falling away” will not happen until the Church is taken away (in Rapture; 1 Thess. 4:13-18), and the “man of sin” is revealed. Only then there will be a wholesale abandonment of true Christianity. Has that happened? Absolutely not – yet! Paul said “some will depart”, not all! (At this point you need to read with them also 1 John 4:1, where John warns “…believe not every spirit, but try the spirits whether they are of God, for many false prophets are gone into the world”. In 1842 he added to his “godhood requirements” the temple ordinances which he had mostly copied from the Freemasons. This is the Mormon-salvation plan by works. True doctrine of God is presented in the Bible, given to us by God Himself. (2 Tim. 3:16.) Eternal life is the Gift of God to be received through faith in Jesus’ finished work for our salvation. (Romans 10:9-10; Eph. 2:8-10.) That is how we gain eternal life with God. Humans are a creation of God and descendants of Adam. We are “children of the flesh” until we are born again. new birth will live together forever in God’s presence. We must share with them the biblical Gospel, which is a message of death, burial and resurrection of Jesus so that our families can be with us forever in heaven. We are not saved by works, but we are, after our new birth, created for good works to represent our new life in Christ. This commandment is so that we will not end up “ashamed” by accepting as truth teachings that are not of God. If we do not test the doctrines and teachings that Mormon missionaries present and testify of – by comparing them with what the Bible says about God, Jesus and salvation – we could be led astray by the spirits and prophets that are not of God, just as 1 John 4:1 and 1 Tim. 4:1 warn of. The Holy Spirit of God would not give us “feelings” or “testimonies” of “these new truths” that contradict the Truth and doctrines that God has given us in His Word. The Word of God will always lead us to truth. The Bible says that God is not a man. (Num. 23:19; Hosea 11:9.) We were not born to God and his wives in “yonder heavens”. We did not come from heaven. We will not become gods! We did not pre-exist. We have written several papers on how to witness to Mormon missionaries, and more about what they teach. We can send them to you if you’d like to have more information on this or any other LDS topic. We also have a list of Bible scriptures missionaries use (out of context, of course). We can send that list to you also. You can also send to us your questions, and we’d be happy to reply. It is such a huge blessing and joy to see a Mormon coming to the real Jesus and leaving Mormonism. We have experienced that many times. have about these things with those who have been lied to and misled. Don’t worry about what to say because any conversion to Christ is the work of the Holy Spirit. Just be willing to be used. IMPORTANT NOTE: Compass uses the NASB Scriptures in the above article, but if you have the opportunity to witness to Mormons, only use the KJV version of the above Bible verses because that’s all they will accept.